You Are Here: Home » High Index Lenses » What Can You Put High Index Lenses Into? Have you ever lamented the thickness of your lenses either at the edges or center? If so, we can confidently guess that you probably have a strong glasses prescription, correcting +/- 3.00 or higher. For nearsighted people, this usually results in wide, flaring lens edges that stick unattractively out the sides of slender glasses frames while for farsighted people, the lens thickness manifests as a bulging center of the lens that artificially magnifies your eyes for others who are trying to make eye contact with you. You may have spent much of your life frustrated with the thickness of your lenses, but there is actually a solution that could slim your lenses down by as much as 35% thinner than standard plastic or glass lenses. Many people in the world need reading glasses, and you may be surprised to learn that they need them for a variety of different reasons. Farsighted people often need a pair of normal-distance glasses and an extra pair of reading glasses for up-close desk and book work. For them, reading glasses provide a strong vision-shortening power so it doesn’t hurt to focus on something nearby. Many people who had good vision most of their lives become slowly farsighted as they age, requiring reading glasses later in life, however not all elderly people use reading glasses for this reason. Those who get cataract surgery have their natural eye lenses replaced with what you might see as permanent contacts, but they lose the ability to change their range of focus all that much, making it easier to read with reading glasses. Finally, there are those who are so nearsighted as to be nearly blind. Some people need very gentle vision extending lenses just to read a book held in front of them. What’s the benefit of high index reading glasses? The answer is quite simple and easy to understand. Reading glasses tend to be quite small, usually compact enough to keep in a pocket, pouch, or small purse without taking up a lot of space or getting in the way. This means their frames tend to be light-weight, slender, and often made of metal. With thinner lenses, your reading glasses won’t suffer from the bulging or jutting lens problem or catch on things when stored. Instead, you can enjoy those tidy, slender reading glasses with perfect visual clarity. While most people neglect an obligation to protect their eyes during dangerous activities, safety glasses are an incredibly important part of many occupations and should even be worn during certain household chores like lawn maintenance and cleaning with strong chemicals. Anything that could involve a dangerous projectile, fast-moving objects, or splashes of caustic liquids, safety glasses are a must. 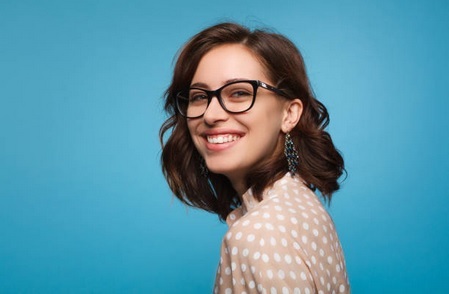 Though your normal prescription glasses don’t count as safety glasses, you also don’t have to wear an oversized pair of plastic safety lenses over your normal glasses either. You can always order a pair of prescription safety glasses with high index lenses. Why are high index lenses useful for safety glasses? The shape and design of a pair of safety glasses matters a great deal and depends on the kind of eye-risking activities you’re involved in. Some neeed to be wide, others need a splash-guard lip, and many need to be wrap-around to provide good periphral vision. Because shape is so vital, big, thick prescription lenses often can’t fit right in a stylishly and functionally safe pair of safety-rated frames but the thin profile of high index lenses are perfect for the job. Driving a motorcycle as a very special set of requirements. Not only do you need to wrap your entire body in leather and wear a helmet to stay safe, you also need absolutely impeccable visual clarity. Every boost to your awareness matters as the smallest, squishiest vehicle on the road. Peripheral vision is unquestionably necessary to see other cars around you who might miss you and try to merge into your lane. They also need to fit very tightly and comfortably to the face in order to protect the driver’s eyes from wind, weather, and airborne debris and an anti-fog coating isn’t going too far. Rather than wear glasses under a helmet visor, a lot of people choose to get their own prescription motorcycle glasses instead. When it comes to motorcycle glasses, having the lenses conform to the necessary design is vital. Thick, bulging lenses are often quite impractical as motorcycle glasses because they don’t fit as well into the frames and flaring edges might even conflict with the foam face cavity insert that keeps the road dust out of your eyes. High-index lenses, on the other hand, are slim and convenient, able to fit perfectly into almost any glasses frames and strong enough to survive harsh road conditions. While the trend is fading, it’s still not unheard of to have a special pair of glasses just for working with computer screens. Computer glasses may never fade completely into the past because some people, both near and farsighted, need help adjusting their eyes to the unique range that computer screens tend to sit at. Of course, back in the day there was little need to worry about what you looked like while sitting at your computer, but times have undeniably changed. Now, with the abundance of web cams, streaming programs, and video calls, what you look like at your computer could easily be seen by more people than you could possibly meet in person in a single day. This means that unless it’s your ‘thing’, the coke-bottle look simply has to go. Almost by default, if you wear computer glasses they are probably of a truly impressive thickness but as times change, so too can your glasses. With high-index lenses, the style of your computer glasses can go through a transformation. In fact, now you can pick any pair of frames in the store that you like, sure that your new slender lenses will look good in them and your online friends, family, or audience will finally be able to see what your eyes look like behind them. 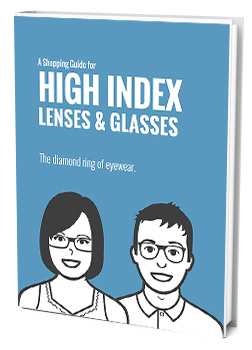 High index lenses can be used for all sorts of interesting specialty applications, but they are always a good option for the perfectly normal glasses you wear all day, every day. This is the pair you wear to work, school, play, and even special occasions so naturally, you want to look your best. With high index lenses, you’ll be able to wear whatever style of frame you like, show off your beautiful eyes to the world without that thick lens eye-distortion, and really enjoy being a member of the proud glasses-wearing community.